Leonard Cohen’s “Anthem” drifted in my mind while tracing a brushstroke with my bare hand thru the half finished painting. It completely changed the dynamics of the painting. Planning art exhibitions is a little like planning your birthday party for strangers. There may be months or, in this case years of preparations. You hope dear friends arrive, to meet new ones, have inspiring conversations, enjoying exchanging of gifts. It can be an exciting, nerve wracking, rewarding event inspiring a desire to sleep for month after. This is how I have felt since returning from a whirlwind year & month long western ‘tour’. It is only the second time in a decade I put down the brush for more than a week. Painting after a month away can be a challenge, like your first season golf swing, or running after a month break. One may feel daunted & rusty. I prepare for a painting hiatus by leaving at least two paintings near completion & one barely begun. Upon return, projects are viewed with fresh eyes, without the pressure of starting a completely blank canvas. I ease my way in by finishing two the first two fairly quickly, encouraging a feeling of accomplishment. Next, for the project in early progress (or the first blank canvas) I use a completely different approach by choosing a difficult composition. One that scares my socks off. Painting a canvas in progress facilities bravery, because there is nothing left to lose, or fear of ruining a new canvas in case it goes south. Some of my best creations came to fruition applying this method. For one thing, the underpainting contributes to the composition in ways I could not have imagined. SKY began as a moonlit tree. Returning to the studio I traced a beam of light along a painted branch and a light filled sky filled my mind. 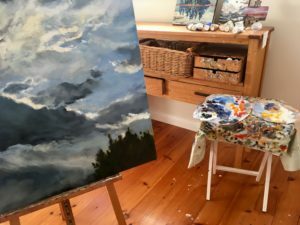 The painting changed direction and SKY emerged. The vertical rather abstract orientation, and focal point near centre make the composition challenging. It’s balanced by amazing diagonals soaring across the sky painted in a more realistic style. It helps you feel at one immersed within and pulled along. I could spend a lifetime painting skies and it would be enough. An impactful exhibit of time made visible. Fleeting whispers merge, vibrate, disappear and change form as quickly as a thought threads thru your mind. The sky overhead is a wonderful reminder of the life’s fluidity. We bear witness to it in real time. The drama, action, and contrast is all there, each unique in moments, colour, movement, and light playing on the landscape. A tangible force of energy we can observe daily. 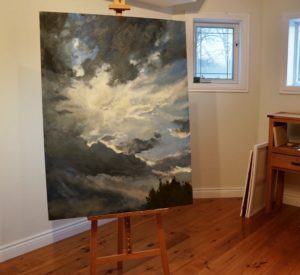 While adding filtered light near completion in the painting, Cohen’s song drifted in my mind, bringing a heartfelt warmth. How appropriate for a painting that was not meant to be, but contributed to what is. How fitting for a sky that moves in light with darkness giving way. “Forget your perfect offering.” How true of Impressionism, not illustrative of photo perfection, but reflecting something beyond, with emotional intensity, offered in love. Note: Looking up is the quickest way for a mood lift. Why? Head position greatly influences mood.